tuovni: Nice start! The chairs could use some darkening as they become further away from the screen, it will also help create some more depth. The inside of the popcorn container could use some shadowing, occlusion might work well for that. The character’s right arm is getting very blown out. I wouldn’t expect that in this setting. Try to pull that back a little bit. The inside of the character’s mouth is getting very bright, make sure the lights in that area are using shadows. BarberofCivil: Looking good. The opening for the projector could use a little illumination from the projector to give the wall some thickness. The character’s skin could use some warm colors especially in the very dark areas. You have some pretty intense Moire patterns going on the chairs. See if enlarging the bump texture and/or decreasing the depth a little will fix the issue. There’s a very high contrast line where the wall meets the ceiling. Darkening the back wall where the projector is should help a little bit. SharinSri: You’re off to a great start. I’m not sure the cool light coming from the right of the image needs to be so strong or makes sense. It may make more sense to have a warmer red light that would be from something like an exit sign. But, either way it should be a lot dimmer. I’m not sure how I feel about the black background. Perhaps you could put in a light for the projector or some very subtle fill lights from floor or wall lights. asinn: Very nice. There’s a good sense of volume and space in the room. This image has progressed a lot. I’m not a huge fan of the vertical lines all over the image, they cover a lot of things up. But overall good work. Masood716: It’s hard to see what’s going on with all the brush strokes. Overall it seems very “busy”. Maybe try nailing down your key light direction before moving on to other things. BlackPanther101: Make sure your lights are casting shadows, objects look like they’re floating because there’s no contact shadows. Overall things are very bright and blown out, this makes me think more of an outdoor scene on a very bright day. Try to start with just one main light direction with shadows and slowly and subtly add lights in a logical manner. tre333: Nice updates. The highlight on the character’s eye is blocking his pupil. See if you can move it up over the pupil or to the right of it a little. The kick on the character’s left shoulder seems unmotivated since the chair is behind him. It would make more sense if it was up on the ear since that’s more likely to be reflecting the projector’s light. 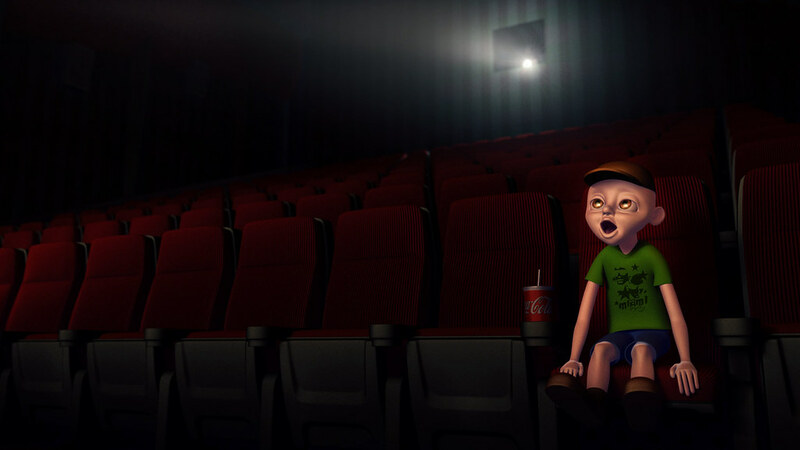 The second row of chairs behind the character could be darkened some to give the image a little more depth. tsshivshankar: The screen doesn’t seem to be emitting any light. Try putting a light right behind the screen and have that be your key light. An area light scaled to the size of the screen would probably work best but may take a long time to render. You could also try a spotlight behind the screen with soft depth mapped shadows. Just make sure to enable shadows on the screen’s light. fodeba: Welcome! Interesting lighting concept. Overall each light source seems to be at the same intensity. For starters, I’d expect the screen to be sending brighter light onto the front of the character than the back of the character would be receiving, especially since there’s the dark chair behind it. It’s okay to do crazy light directions if that’s your intent but for it to be believable some light principles will have to be grounded in reality. pixeldompteur: Good updates. The eyes could use much brighter highlights so they can be the brightest part of the character, especially since it would be a reflection of the screen which is the brightest part of the theater. The saliva coming out of his mouth is looking very ‘milky’. I think that’s because of the consistent color throughout it. To make it look more like water see if you can darken the diffuse a lot and then just have some bright highlights on it. 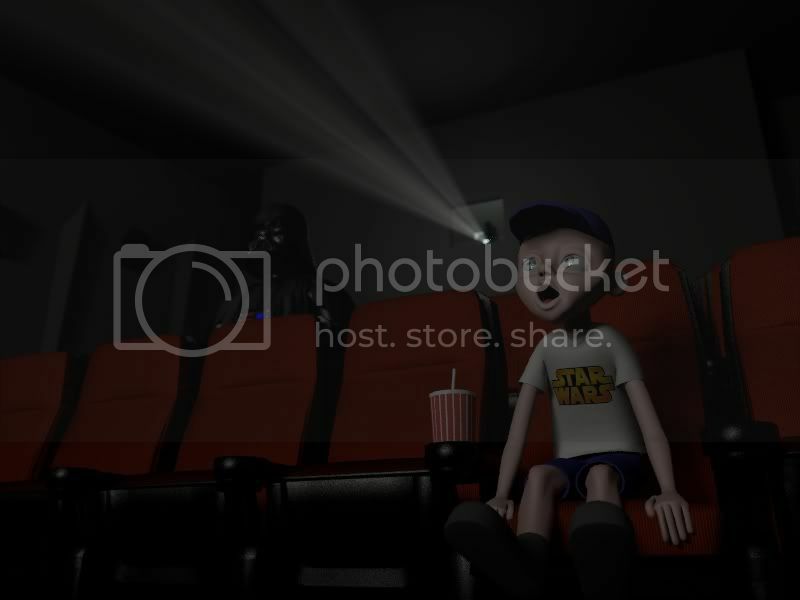 The projector could add a few highlights to the left side of the character’s head and hat. They don’t have to be too bright but similar in value to the tops of the chairs. ducvemt: Great improvements. The black value in your image seems to be too bright. Places like underneath the arm of the seat are at 20% bright when they should be closer to 0. The rims on the tops of the seats are getting a little too bright, try to make them similar in brightness and color as the light on the character. Here is my first submission . Please give Critics and comments. Thanks for your comments kanooshka. There are some very good reasons for some of these current effects that I will be working on yet. The film image I am using has a distinct blue cast to it (from “A Clockwork Orange”, normalized colour is rgb <0.615,0.988,1.351> for the particular scene) which affects the warmth of the skin colour, however the skin colour may be a little pale still regardless, so I may alter that yet. Or I could change my film to one with a more neutral or warm cast to it. The moire pattern is simply because I have not uvmapped it, it is a global cube-based pattern, so curved and non-parallel objects will look odd. Scaling up or down will not diminish this effect, ultimately I will just likely just change my texture pattern. The contrast is there at the ceiling because I have not added texture to it, and it is basic black right now. For illumination at the projector booth, I do have some fill lighting along the projector beam, but it does start some distance from the booth. Perhaps I will pul it back so that it starts at or closer to the booth and opening. I will try to tune up these items for my next submission. Title : " His first time "
So this is a really quick test for now just want to see the fell. I will definitely add light beams and different colors to the lighting. Been doing so much game-art so this was a refreshing break and my first entry in a lightning challenge! Kow: Looking good. The light on the character seems unmotivated from off the right side of the image. If this were in the middle of a film, which looks to be true from the projector, the only other strong light source would be the screen. The projector is looking great. The seats are looking fairly shiny, if that’s true I’d expect them to be receiving some reflections from the projector as well. The character and seats seem to have a spotlight on them, I’d expect a little more consistency over the row of seats, or at least a little more subtle with the spotlight. Keep at it. Goksimaster: Nice start. Overall not too much to comment on. The rays behind the character make the light source look very large because of the size of the blown out area. BarberofCivil: No problem, they’re all just suggestions. Take or leave whatever you like. I hope at least some of it is helpful for you. mettlemaster: Welcome! You’re off to a good start. The eyes are really disturbing to me, the sclera looks very blue. See if you can get rid of the saturation and brighten the eyes up a little bit. The projector in the back seems separated from the rest of the image. Maybe you could add in a little bit of fog on the light as well as add in some subtle light from it on the tops of the chairs and character. The character’s skin is getting very dark. Try using sub-surface scattering to soften the light’s terminator and to add in some warm tones. If you don’t want to add in scattering, you could always add in some warm fill lights. update . the next version will be without the watermark. Thanx alot Sir for your comment. I’ll post the updated version soon. Hi. This is the my 1-st stage render. Thanks kanooshka, I do appreciate any advice/comments/criticism given, and it was of use. It was just nice that most of the items were regarding things I was already aware of and working on. Updated. I did ‘pinken’ the skin a bit, but also took our intrepid little movie-goer to a different theatre (hint is on the tshirt). The screencap for this has a more neutral cast (rgb <1.01,1.00,0.96>. I swapped out the seat texture for vertical 'corduroy’like one that works better without the moire artifacts. All walls ond roof are textured the same, so hopefully the contrast isn’t as big. I did also add a light to the booth. I’ve perused these lighting challenges on 3drender.com for quite some time, but finally I’m taking a stab at it myself. This is a first attempt at getting a handle on the scene, mainly focusing on the seat texturing and getting the overall lighting somewhat in the right zone. I can’t afford the big-boy toys others are using here, and I love open source and free/inexpensive tools; models edited in Silo 2.1 and rendered with POV-Ray 3.7 RC3 (an amazing free renderer). another update. I think I’m finished with lighting , maybe I tweak something here and there. Goksimaster: Nice update. The skins backscattering looks like it’s coming through the characters head. Try decreasing the back-scatter depth so that the ear is backscattering but the face does not. The image is plenty bright so don’t worry it being too dark. The rim on the character’s left shoulder looks out of place. I’m not sure where that rim would be coming from. rmcgregor: Interesting idea. 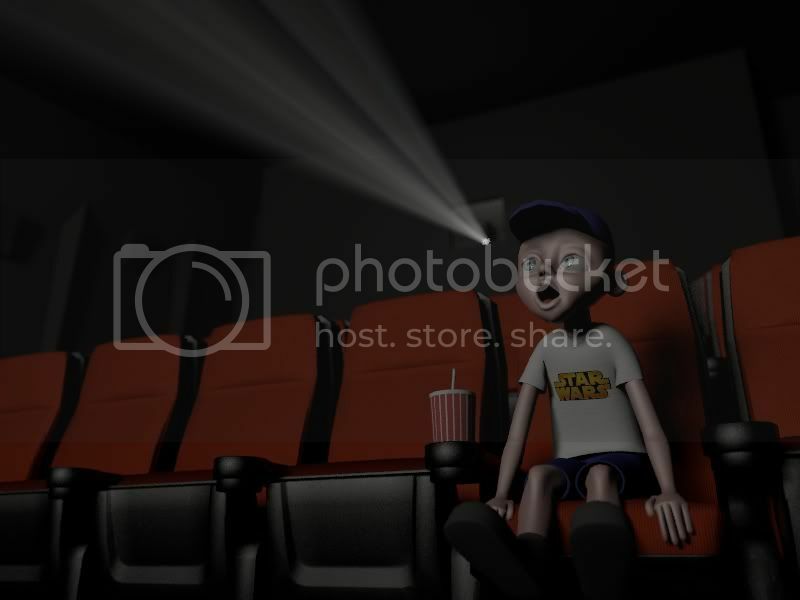 Right now the projector feels “disconnected” from the rest of the image. I’d like to see some light from it onto the tops of the chairs. BarberofCivil: Good updates. The skin’s highlights are a little too bright. Especially the arms and cheeks. For the most part skin has the brightest highlights on the forehead, nose and lips. The skin is going black on the side of his head and in his ear and could use some fill light. Here’s my latest WIP with all scene elements and textures in place (finally!). As kanooshka suggested I added a rim light for the seat tops to tie the projector into the shot more, and it looks much better now. I think I am getting close to my final. I toned down the shininess of the skin a bit. Altered the black plastic seat tetxure a bit so it wasn’t as over saturated. Added a pane of glass at the booth that shows some projection of the projector beam on it, it isn’t out of focus as it should really be, but the focal blur should hide that. Added in some radiosity to pick up some fill lighting in the shadowed areas. I may yet still try to tweak the general lighting levels and contrast and some of the textures a litlle if I can find something I like. And maybe fool with the viewing angle and perspective a bit. Thanks for your comments kanooshka.You’re right. Here is some improvement. Thanx for your Suggestion kanooshka Sir. Critics & comments are most welcomed. I have a question. How do you guys go about making the volumetric light for your projectors. Right now, I’m using parti volume to create my volume light, however it looks more like fog then actual “rays of light”. I’m having problems really adjusting it to look any different. Any help would be much appreciated. I am using POV-Ray which is a ray tracer myself. For my projector beam, I simply have a scattering media and project my light through it.